Bronx, New York: As a Nigerian, I am often frustrated and infuriated by the government officials who are corrupt and who mismanage natural resources. Sometimes one has to wonder where the champions of justice are in a country filled with economic and political oppression. Fortunately, they do exist, but sadly there are very few. That number got even smaller on September 5th when Nigeria’s Senior Advocate, Gani Fawehinmi passed away. Fawehinmi was Born on April 22nd 1938 in Ondo State, Nigeria. He was an Author, Philanthropist, and Human Rights Lawyer who championed the cause of the under class and challenged many of Nigeria’s military dictators. Because of this, he was imprisoned numerous times over a thirty-year period beginning in the 60’s. In a popular national case, he represented Dele Giwa, Editor and Founder of Newswatch Magazine who was killed by an explosive parcel in his home on October 19th 1986 for “attempting a social revolution and arms smuggling.” Later, the then President of Nigeria, Ibrahim Babaginda, would testify in court. Even though justice was never served in this case, people began to respect Fawehinmi as a fearless human rights advocate. He was also known to be an extremely generous man as many young people benefited from his self sponsored scholarship program. He also gave free legal counsel and representation to student activists and many victims of oppression. Even with all his troubles with authorities, he managed to win numerous awards including: The American Bar Association for Human Rights 1996, Man of the Year Concord Magazine 1988, Member of Ghandi Foundation 1971, and Nigerian Bar Association (Ikeja) Service and Commitment to rule of Law 2001. “Stand up for what is right, even if you are standing alone” is a famous Gani phrase. It’s right to be inspired by this champion of human rights because he gave people the courage to speak up, even at the risk of persecution. When we complain about our governments and those in power, we should also remember to honor those who are using their position in society to develop their nation and the continent as a whole. 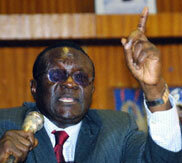 Gani is survived by two wives and fourteen children.